Opposition parties from the south have been calling for a delay of the elections, the first multiparty ones to be held since 1986, and threatening a boycott due to concerns over security and possible rigging. However, al-Bashir -- who is running for office again despite being wanted by the International Criminal Court for alleged war crimes in Darfur -- has been campaigning all over the country and insisting the elections be held as scheduled. At a recent rally held at Damazin in the Blue Nile state, al-Bashir lashed out at a coalition of opposition parties who have been calling for a temporary delay of the elections. "Holding elections in Sudan is a national obligation that should be fulfilled... we don't have options in this respect. If they took the right to oppose the elections, we do have the same right to reject the referendum in the south." Al-Bashir also threatened to kick out election monitors, and cancel a referendum on independence for the south should opposition parties boycott April 11-13 elections. 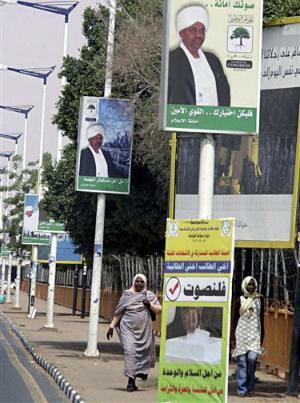 Meanwhile, the Sudan People's Liberation Movement (SPLM) announced on Wednesday that its candidate, Yasir Arman, would boycott the April poll because of electoral irregularities and the continuing conflict in the country's western Darfur region. A concern echoed by Human Rights Watch (HRW). "Conditions in Sudan are not yet conducive for a free, fair and credible election," Georgette Gagnon, HRW's Africa director, said last week. "Unless there is a dramatic improvement in the situation, it's unlikely that the Sudanese people will be able to vote freely for leaders of their choice." According to HRW, the problems in Darfur and repression of political opponents are major obstacles to a free and fair vote. In a report released on Tuesday, the Brussels-based International Crisis Group accused the government in Khartoum of using flawed census figures to draft unfair election laws and skew electoral districts in favor of the ruling National Congress Party. Also, the U.S.-based Carter Center, which has been allowed to observe the process, has suggested that Sudan postpone the vote to ensure that it can be properly administered by the National Election Commission. Khalil Ibrahim, the leader of the Justice and Equality Movement (JEM), the largest rebel group in Sudan's western Darfur region, also joined the call on for a delay of the elections. "These elections are based mainly on false senses, especially in Darfur. Masses of populations ... will be excluded from the elections," He continued to describe the elections as a "theatrical act" on the Qatar-based al-Jazeera TV. But al-Bashir remains unfazed. He has been campaigning diligently, appearing in different regions wearing different costumes. Last year he defied the International Criminal Court which issued an arrest warrant for his arrest for war crimes in Darfur. In a few days, he'll parade victorious in Khartoum; just another scene, from another act.